Durban-based Southern African Shipyards (SAS) will on Friday 30 November cut steel for the South African Navy’s new hydrographic survey vessel, which is being acquired under Project Hotel. The SA Navy chief will press the button to cut the first plate of steel at the end of November 2018 – traditionally a symbolic ceremony in the shipbuilding industry – which will be broadcast via live TV feed to some 250 VIP’s in a nearby glass-fronted marquee. 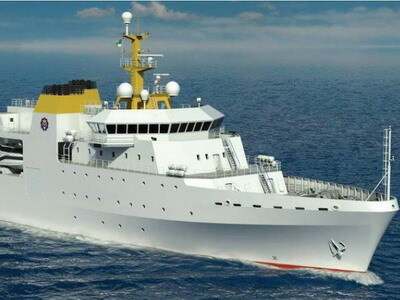 Southern African Shipyards partnered with Vard Marine to develop the hydrographic survey vessel for the South African Navy. The vessel will be 95 metres in length with about a 12.24MW installed diesel electric power plant and a maximum speed of 18 knots. The ship will have a 10 000 nautical mile range with 44 days endurance; incorporate the latest hydrographic and oceanographic sensor suite and will be manned by a total crew of 120 comprising ships’ crew and scientists. The vessel will be ice-strengthened to Polar Class 7 requirements. “It will scan the ocean floor, mapping large areas of the southern hemisphere ocean floor. The vessel is aligned with IMO [International Maritime Organisation] requirements to provide SA Navigational Charts for the SA Coastline as well as the capacity to carry it out to other countries,” explained Greg Delpaul, SAS’s general manager of shipbuilding. The new ship will replace the SA Navy’s current SAS Protea which has been in service since 1972. SAS was awarded the Armscor contract for the ship late last year. Preparations have been under way since December 2017 and SAS will build the vessel with the help of various subcontractors who will integrate various systems into the ship. They will be based at the SAS’s Bayhead works, during the project, which is expected to take 40 months. The project will mean work for about 500 people, including apprentices, artisans, technicians, engineering interns and engineers in different disciplines. Armscor and the SA Navy already have trainees and interns at the shipyard. Southern African Shipyards said that preparations for construction of the new hydrographic survey vessel involved a special tank test, which was carried out in Holland. “Before you build a ship of this nature you have to make sure that it will be able to withstand the sea conditions in the Southern Ocean that it will be operating in,” explained Delpaul, who flew to Holland in September to witness some of the six month trials. The tests were carried out by the Maritime Research Institute of the Nederlands, which built a seven metre-long wooden scale model of the vessel, that was tested in a 240 metre-long tank, which was 18 metres wide and 8 metres deep. The facility visited by the SAS team was a depressurized wave basin tank. The tests that were witnessed were: cavitation in waves; air chambers in waves and wave impacts with air entrapment. “The design is superb and everything worked exactly as designed. The trials took place over six months to ensure that everything was perfect,” Delpaul added. The steel cutting ceremony for the hydrographic survey vessel also marks the steel-plate cutting ceremony of 3 500 ton a liquid natural gas (LNG) barge that SAS was contracted to build for DNG Energy, a South African-based company in the energy industry. Work will start on the 147 metre-long vessel in the first quarter of next year and it will take about 12 months to build. The barge will be built in four parts and then assembled together, before being finished off and painted in the dry dock.